According to new stories Mercedes-AMG is working on a record-breaking street-legal hypercar. Dubbed the Mercedes-AMG R50 by German magazine Autobild it is set to be released in time for AMG’s 50th Anniversary next year. Details are still scarce but with the new R50 AMG should move into hypercar territory. It should come with two electric motors producing 150hp each powering the front wheels and a mid-mounted 1,000hp 2.0 liter four cylinder turbo engine. This would bring the combined total to a mindblowing 1,300hp. AMG is aiming to keep the weight of the R50 at or below 1,300 kilograms. 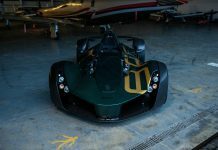 In efforts to do so the two-seater monocoque is made from carbon fibre. Additional technical innovations include rear wheel steering (recently introduced on the AMG GT-R) and adaptive suspension that can control each wheel individually. The R50’s design is inspired by Le Mans racers and might reflect on the legendary CLK GTR. Also in terms of cockpit and driver position the comparison to the CLK GTR should not be far fetched. The seating position is as low as it can go. Pedals and steering wheel can be adjusted to accommodate drivers of various sizes. To reduce drag and optimize aerodynamics the cockpit is quite narrow so the driver and passenger seats are near together. Large wheels and a carbon fibre wing wrap up the aerodynamic appearance that should be a competitor for the new Aston Martin RB 001 and next generation hypercars like the Bugatti Chiron. Thanks to technical know-how from Mercedes-Benz the upcoming AMG hypercar should also be among the safest of its kind. Several assistance systems aid the driver where possible to improve safety and lap times alike. A price tag of between 2 and 3 million Euro for the limited edition R50 AMG hypercar is likely.